Members - $2 per hour per child / Non-member - $3 per hour per child. After the first hour, each half hour is $1.00 for members and $1.50 for non-members. i.e. for a 1/2 hour workout with 2 children, the fee will still be $4 (2 children x $2/hour) for a member or $6 (2 children x $3/hour) for a non-member. Take advantage of this, and get that full hour workout in! Members - $20 for a 10 hour punch pass / Non-members - $30 for a 10 hour punch pass. 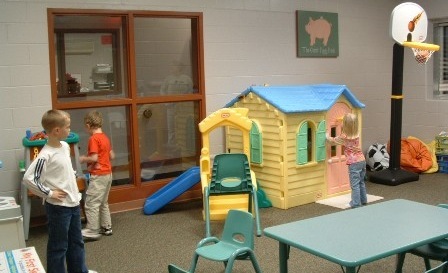 The kids room may be used during non-babysitting hours. Sign the key out at the check-in desk in order to use the kids room. A person 9th grade or older must be in the room at all times. The room must be cleaned up when finished.